Adelaide has some really rocking modern Asian fusion restaurants, and Fish Head joins the ranks with gusto. Offering Indonesia, Malay and Indian cuisine, the menu is exciting and fresh, just like the food. We went for dinner on a stinking hot weeknight, and ordered a bunch of dishes to share. 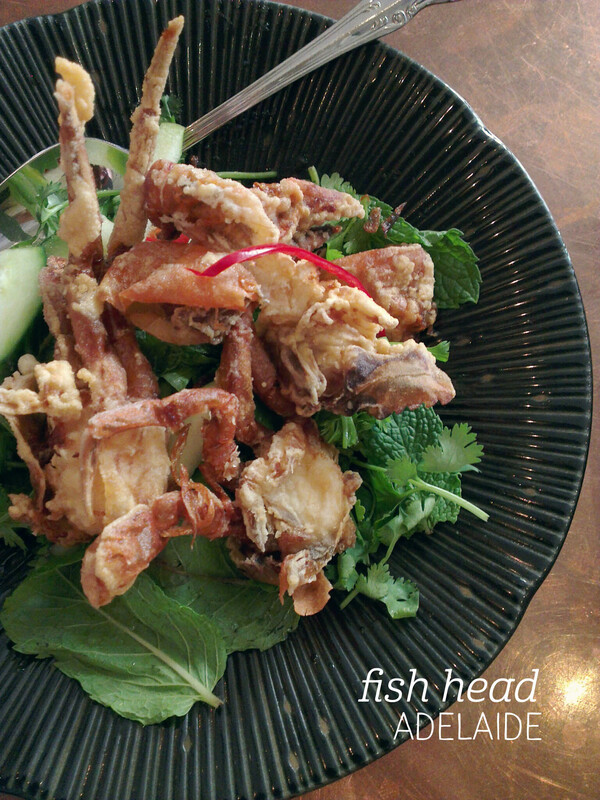 First up, the tempura soft shell crab with a herb salad ($15.50) was utterly delicious – the crabmeat was tender, the shell crisp and the salad had a good amount of kick to it. The crispy pork belly ($12.50) paled a bit in comparison, and the staff didn’t explain there were only 3 pieces (4 of us were sharing), which was disappointing. But the mains were all excellent, starting with the gado gado ($17.50), drenched in peanut sauce with firm tofu and plenty of fresh vegetables, it was perfect and refreshing on a hot night. 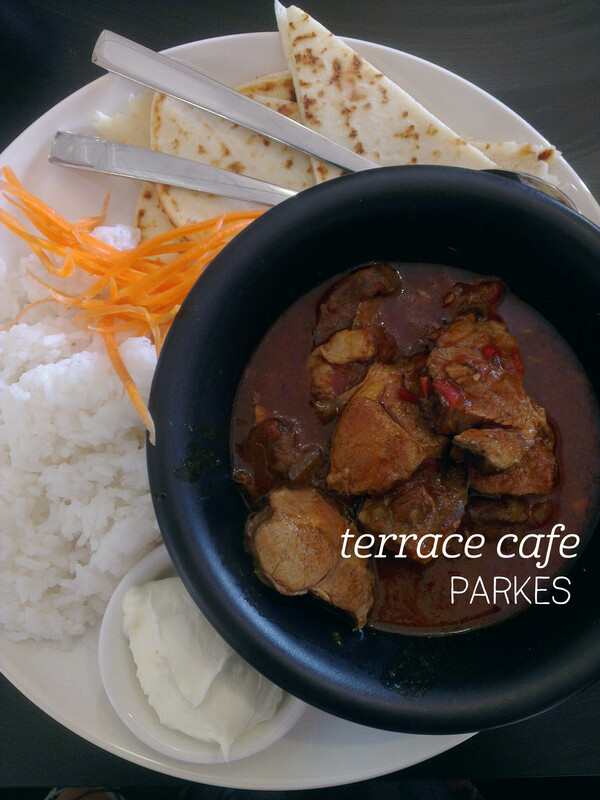 The highlight was definitely the butter chicken ($20), which we had with rice ($3.50 pp) and garlic naan ($3.50 pp). The chicken was super tender, and the curry had such depth of flavour I could have sat with a bowl all night. Highly recommended. We finished with a whole crispy barramundi ($35.50), which was very tasty but didn’t have a huge amount of meat, and a perfectly matched raw mango salad. Highly recommended. 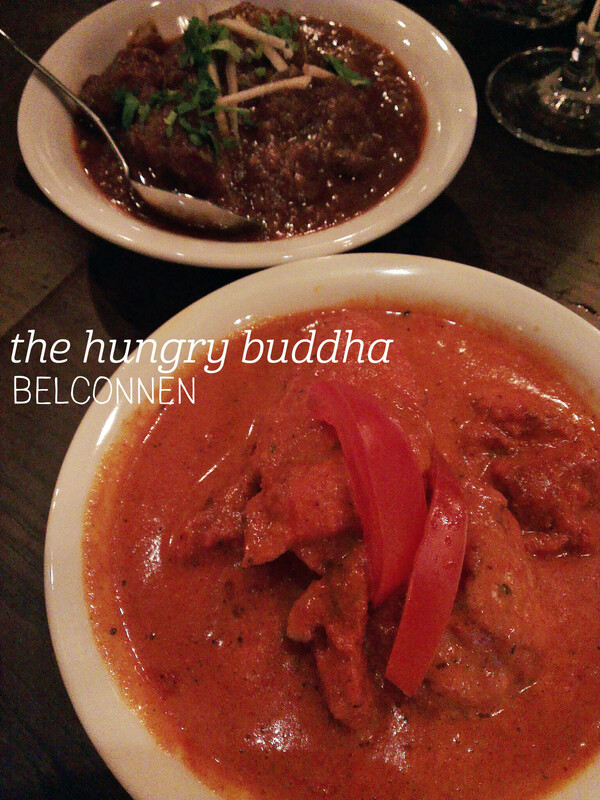 I dined as a guest of The Hungry Buddha, but all opinions remain my own. I can’t believe I’ve never eaten at The Hungry Buddha – when owner Lachhu invited me to the soft launch of their new Belconnen store, I jumped at the chance. We started our Nepalese feast with mo mo, traditional chicken dumplings served with a homemade pickle ($9), and the makkai fry ($8.50), a tasty, hot serve of corn stir-fried with onion and spices. Both were perfect to whet our appetites, with paired well for textural contrast. Next up were the curries, the main game. We shared a range of curries between the group, and I started with the butter chicken ($19.50) – rich, incredibly tasty and with perfectly tender chicken, this dish is definitely a crowd-pleaser. Next up was the jhaneko daal ($17.50) – one of the spicier dishes of the evening, the yellow daal had perfectly cooked lentils matched with a cocktail of herbs and spices (including Himalayan herb jimbu) – highly recommended. We rounded the evening off with a bowl of khasi ko masu ($20), a Nepalese-style goat (on the bone) curry with a vibrant, although slightly heavier flavour. Definitely a great way to eat, trying a range of flavours with friends. Anyone who knows me knows that I’m a huge fan of Japanese curry – it’s what I always bring to dinner parties and was my favourite meal at the dormitory I lived in Tokyo in 2009. 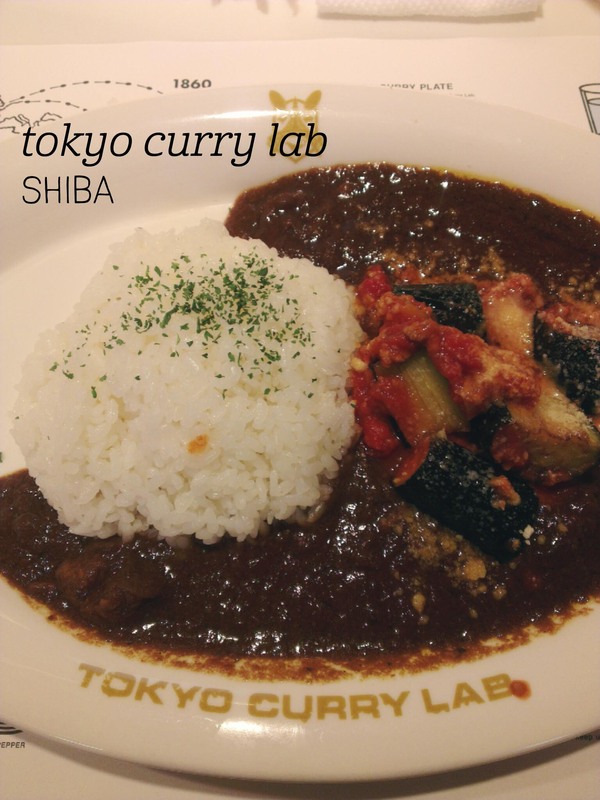 So I was pretty excited to hear that there was such a thing as the Tokyo Curry Lab. Yes, it’s touristy-overpriced, but come on, look at that curry! I went for the eggplant, tomato and mince curry, which is one of the spicier options. As we sat at the funky stools, we learned about the history of curry on the creative paper placemats – it also had good tips for curry stain-removal! The curry came out on a huge plate and whilst it didn’t fill the whole plate, I couldn’t finish all of mine. There wasn’t a huge amount of eggplant, but it was topped with grated parmesan cheese (it sounds weird, but was really tasty). There was a real kick to the sauce and I kept it separate from the rice so I could use the rice to cool down. The flavours were strong and it was definitely not a standard Japanese curry, but I enjoyed it nonetheless. Another ‘wish-I-was-in-Singapore’ flashback! I am a bit of a snacker, and no more so when I’m in a country for the first time, burning energy exploring and trying to find stomach space to eat all of the things. As such, when we arrived in Singapore and had waited a good hour for an issue with our hotel booking to be resolved, I was on a mission to find some food. Luckily, we didn’t have to go far. 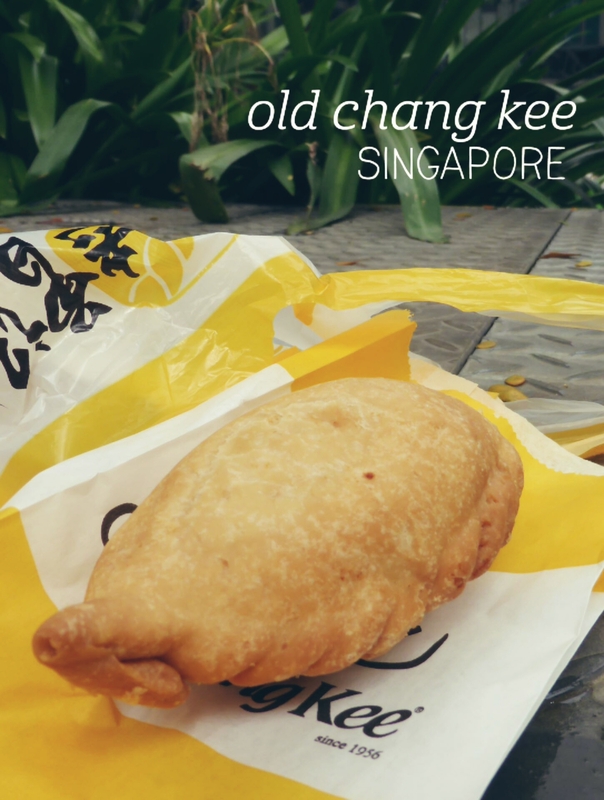 Old Chang Kee’s street-side booth beckoned, luring us with delicious curry scents and the promise of trying a local snack food. I ordered a single curry puff, which was presented piping hot in a bright yellow bag, which I let cool a bit before tasting. I was surprised at how thick the pastry was, but was immediately converted by the incredible filling. A dense mix of chicken, egg and potato, the curry filling was fantastically rich and spicy and jam-packed into the shell. By then I was appreciating the spice-neutralising effect of the thick pastry – although it wasn’t an unpleasant amount of spice – and the mix of textures. The puff was really filling and a perfect snack for the hungry traveller. 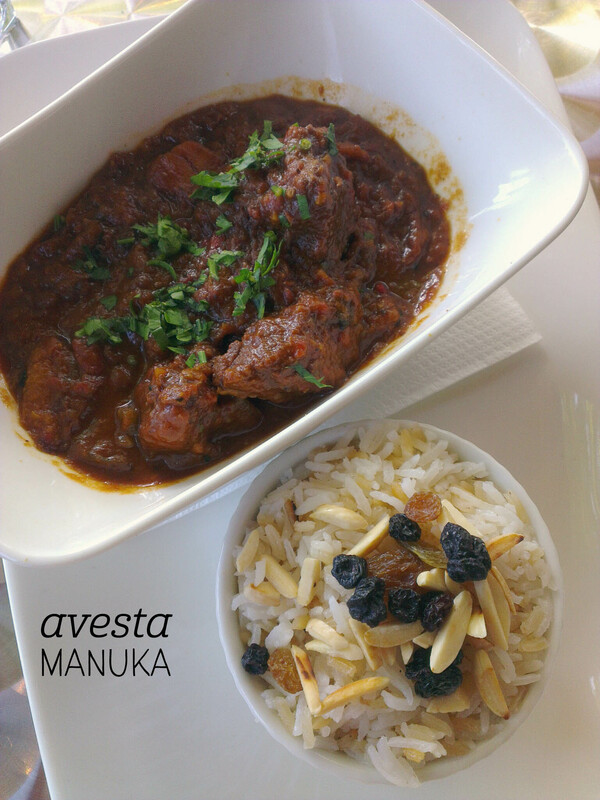 Avesta has opened in the space previously occupied by Pheast, adding a meat/smokehouse and Kurdish flavour to the menu. We had a group of 12 booked for lunch, and were told to sit anywhere (no table prepared for us), so we gathered the outdoor tables and set up to enjoy the warm afternoon. Things here are still a bit new – staff are still getting to know the menu and the register system, but after a long ordering process, the food came out quite quickly. I ordered the Qaisy ($25.50), a Kurdish beef and apricot dish served with almond and raisin garnished rice. The portion was the perfect size for lunch and I really enjoyed the plentiful, tender pieces of beef. The apricots had leeched their flavour into the sauce, leaving their hydrated forms with little more than texture, but the sauce had a lovely depth of flavour (but no heat). The rice was perfectly cooked and I liked being able to dip my spoon of rice into the sauce, rather than having it all in one bowl. The almonds and raisins added great texture and I would have happily added more on top. The food was slightly pricey for what it is, but everyone enjoyed their meals. On a cold and foggy night my friend and I ventured down to the foreshore to pick a Thai place for dinner – Coconine seemed welcoming and cozy, so in we went. The staff were so friendly and happily let us peruse the very long menu. We decided on two dishes to share – the Roast Duck Curry and the Siam Gem on Fire, a stir fry with beef and a tom yum sauce. Our coconut rice arrived with the mains – fluffy and with a distinct coconut flavour, this is my go-to accompaniment whenever it’s on offer. I started with the beef stir fry – there was plenty of beef on the plate and it was sliced really thinly for maximum tenderness. The sauce was packed with flavour and I definitely got the ‘tom yum’ vibe, even though the dish didn’t have mushrooms. I loved the lemongrass flavour and crunched happily on the giant snow peas (yum!). 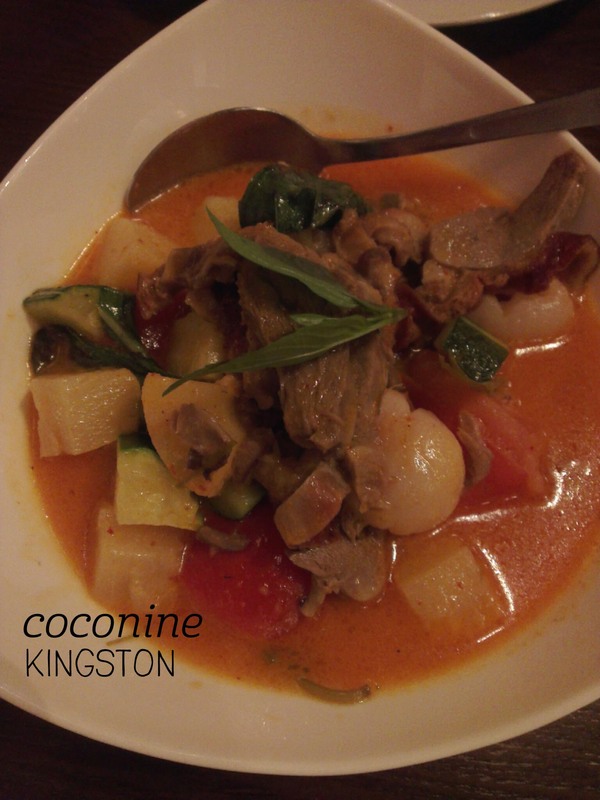 The duck curry had a lot more of a kick to it – the pairing of duck, lychee and tomato with red curry really can’t go wrong, and this version had very tender duck and extra sweetness from pineapple pieces. We left with very happy tummies. On the hunt for a close by, warm place for lunch, my colleagues and I stopped in at the newly refurbished Terrace Cafe at Old Parliament House. Their menu offers great value, with most items between $10-$15. There are some fabulous new artworks up of the building, including a striking one taken at night, and little terrariums on the indoor tables. I ordered the curry of the day for lunch, which was a lamb Indian curry. Our food came out quite quickly and it looked beautiful – the curry was full of meat in a bowl, and the serve included flatbread wedges, rice and yoghurt, as well as some finely julienned carrot. The lamb was melt-in-your-mouth tender and had clearly been slow-cooked to perfection. I found the curry had just the right amount of heat, although it was a little bit oily for my preference. The sauce had a tomato base but I couldn’t quite pick the type of curry. The flatbread was great for mopping up the sauce and whilst I didn’t eat much of the rice, it was good to have on the plate. I also really enjoyed the fresh carrot and would have liked more! Looking forward to trying more of the menu next time.